No straps, ropes, foot hooks or any form of binding; Simply a rider, board, mountain and gravity working together in perfect harmony. 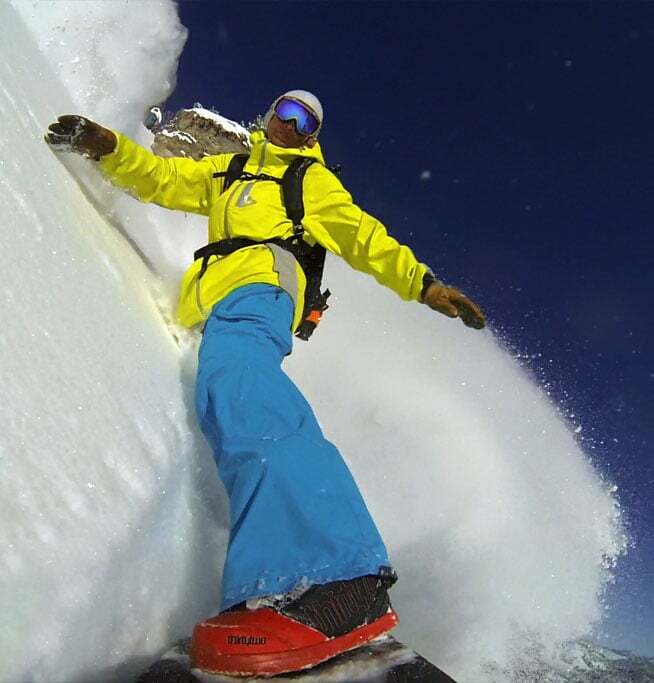 Powdersurfing or “Powsurfing” for short is the art of surfing on snow using specially designed boards (powsurfers) created to be ridden without any form of bindings, straps, bungies, ropes, handles, skyhooks or any other gimmick to hold the board to your feet. Just as surfers ride the ocean and skateboarders ride the streets.. we surf the mountains using nothing but balance and skill. Simply put, its a combination of a rider, soft snow, a board, and gravity working together in perfect harmony. On a Grassroots Powsurfer it doesn’t have to be knee deep powder conditions. 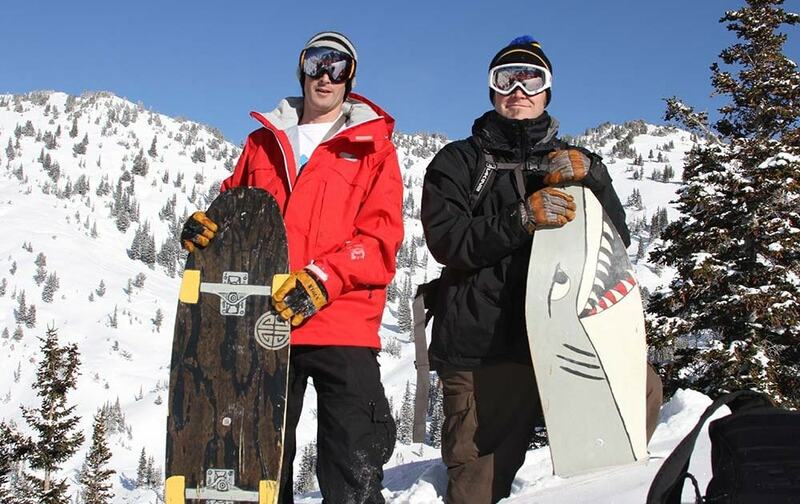 We shape boards that can be controlled in as little as 3 inches of any type of soft snow. Powsurfing is a form of self expression that opens up new avenues of progression and fun, combined with an unbeatable feeling of floating thru pristine powder, free from shackles and submersed in the beauty that surrounds. Eliminating the “binding”, you are now truly riding a board and riding a mountain. Double the pleasure! Risk becomes elevated, skill refined, satisfaction increased. What is small becomes big; what is mellow becomes intense; a whole new relationship forms between judgment, foresight, execution, and success. The rider is forced to elevate their perception and judgement. Challenge is increased and with that greater challenge comes a far greater reward. This is an extension of everything you’ve learned over years of snowboarding. A familiar skill in familiar terrain, but now the training wheels have been removed, and you are back to square one; just a kid learning to ride again, those familiar feelings from your childhood come rushing back, and you are reborn. THIS IS POWDERSURFING! Our powsurfers don’t look anything like typical snowboards. The construction, shapes, profiles, and lengths are specific to an entirely different type of riding, enabling a unique feel and style unlike any other device on earth. Powdersurfing is much different from snowboard in the way the boards turn, float, pop and slash. This is an art form that Grassroots pioneered and we have been working tirelessly for the past decade to perfect it. We invite you to join us in experiencing the most incredible feelings possible on snow and exploring progression in ways that were previously unimaginable. You will discover a new way to interact and harmonize with your environment and you will never look at snow covered terrain the same again. We were the world’s first company to bring powsurfers to the market, creating an entirely unique product and philosophy unlike anything that previously existed. 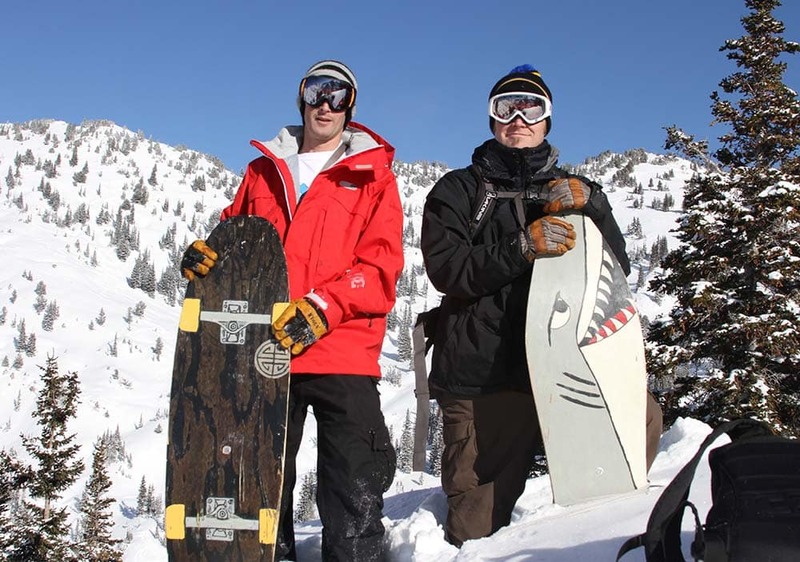 Grassroots Powdersurfing was born in a small garage in Logan, Utah in 2007. Over a decade later our shop space has improved but the production still happens right here at home. You won’t see any toxic fumes spewing from the rooftop or depressed workers coming in an out of this “factory”. What you will see are the guys who pioneered the powdersurfing movement itself, hand-shaping and crafting the beautiful pieces of rideable art that we call “powsurfers”. We take pride in creating and riding products unlike anything the world has seen, that perform in ways that previous generations never realized possible. We blaze our own trail and make our own tracks regardless of snowboarding trends and market research. We make powsurfers because we love to create and we feel the act of powsurfing is the most pure form of mountain riding on earth. We share our passion and creativity with the world in hopes that it will bring more heart and soul back into snowboarding culture. We are not owned by corporations, we answer to ourselves and to the riders who choose our products. We feel that creativity and passion are more important than marketing gimmicks and big budgets. This makes a better product and it makes better people. Grassroots has grown from a small seed we planted over a decade ago. Today our boards can be found all over the world in the hands and under the feet of the most talented and respected snow players on earth. We are proud of what we have created and we have stuck to our morals the whole way through. When you purchase a board from Grassroots you are supporting people who have poured their heart and soul into creating something special for the world to enjoy. Grassroots Powdersurfing is the brain-child of Jeremy Jensen, who has invested over 17 years of bindingless R&D to develop a form of powder riding that is completely binding-free. We have worked tirelessly to create something special that has positively impacted snow riding culture and changed the course of the snowboard industry. By taking a step back to the roots of snowboarding, we were able to leap forward into an avenue of progression and a style of riding mountains that had yet to be explored. The result is an entirely pure form of self-expression that pays tribute to the early intentions of snowboarding and embraces the progression of modern surfing and skateboarding. 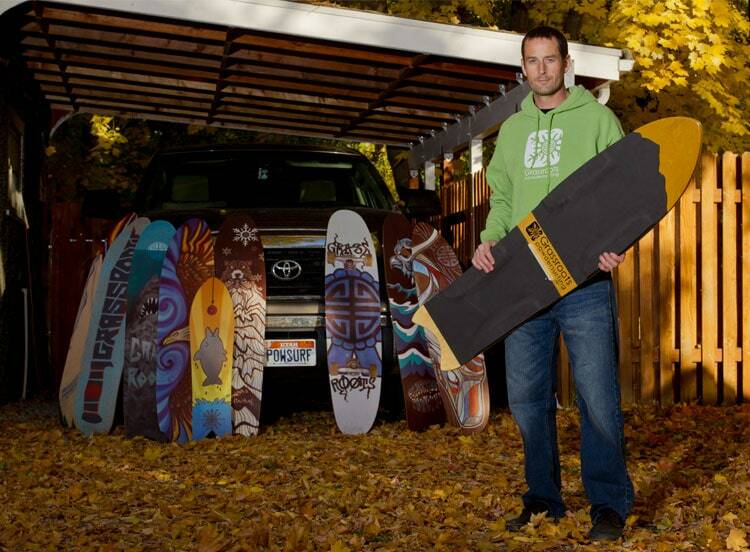 We wanted to give something back to the world of board sports that has given us so much over the years. In the process we have created boards that allow riders to do things previously unthinkable on any “snowboard” in existence. It hasn’t been easy to design, build and market a product that nobody had ever heard of. It’s been an incredible journey and we are proud to see that our products, philosophy and example have given rise to a world-wide movement of binding-free powder riding. Our work has inspired a fresh and creative approach to self-expression in both riding and board design. The extremely small and niche market of powdersurfing is not of concern to us. We do this because we love it. We are driven by passion not profit, and have been since day one. Straps, ropes, skyhooks, magnets? Never had ’em, never will. At Grassroots Powdersurfing our vision and definition of powdersurfing is 100% pure. Straps, ropes, handles, bungees, sky-hooks, magnets or any other gimmicks used to attach the board to your feet are out of the question and have been since we first began exploring binding-free riding. We wouldn’t have it any other way. We surf the mountains just a as a surfer surfs the waves and a skateboarder sure the sidewalks; completely binding-free. We’ve gone to great lengths to design our boards accordingly and with a Grassroots Powsurfer, all you need is balance, skill, judgement and a few inches of soft snow to truly surf the snow. A leash to keep the board from getting lost is the only fixed connection between rider and board and we would get rid of the leash if we could. We’ve set a truly binding free standard from the beginning and we are sticking to it. Powdersurfing is unique from previous attempts at bindingless riding. It is still often mistakenly labeled as “noboarding” or “snurfing” and that’s understandable as they do have a few things in common. However, powdersurfing is fundamentally different in riding technique, difficulty, possibility and board design. It’s like comparing riding a skateboard to riding a razor scooter.. while neither binds your foot to it, they are no where near the same thing. When you are powsurfing there are no bungie cords used to turn and hold a snowboard to your feet as in “noboarding”. There are no ropes on the nose of a water-ski shaped board used for turning as in “snurfing”. With powsurfing, you control and turn the board just as you would on a surfboard, skateboard, wake skate, or any other truly binding-free board; using a specially designed board, proper balance and pressure from your toes and heels. It is 100% binding-free and hands free. Riding technique is entirely different, as is the skill and mentality required to truly surf the pow. 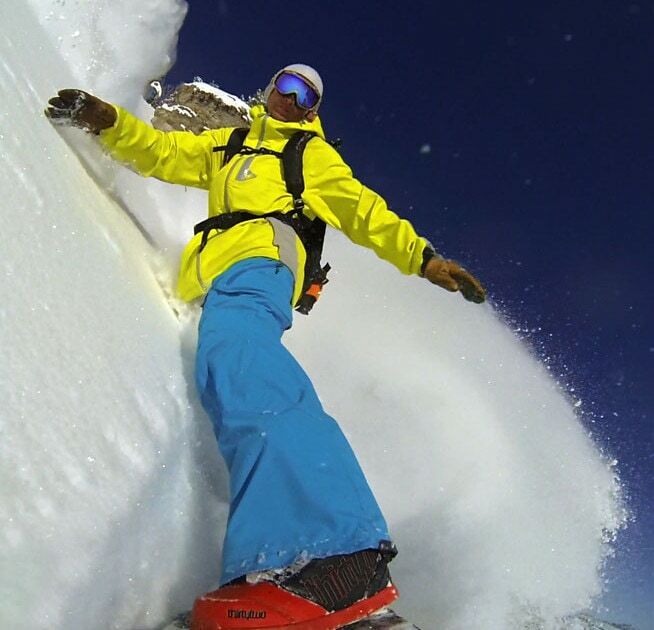 Powsurfing, noboarding and snurfing are all related in some ways but each one is unique. Progression and possibilities are all relative within each discipline and we believe that each of these deserve their individuality and respect in the history and evolution of snow riding. Our exploration of the possibilities of binding-free powder riding date back nearly two decades. What started as the classic “feet between the bindings” pow-turns while hiking snowboard kickers in the backcountry, eventually led to making full runs on a modified binding-free split board. While this was fun and extremely challenging, it was clear that this would not the solution we were looking for. The pivotal moment that put us on our path to create Grassroots was the day we took out an old Winterstick Round Tail Plus on one of the earliest days of the 1999-2000 season. A few runs on this board opened our eyes to the difference that board design can make in performance…especially without any bindings. This led us to years of experimenting with re-shaping snowboards and finally, the arrival of our first handcrafted wooden powsurfers in 2007. Our departure from contemporary snowboard design and construction proved crucial to accomplish what we had set out to do. We wanted to “surf” and “skate” the powder in full control, with the ability to ollie, spin/flip the board and ride both forward and backwards. Once we began shaping our own decks from scratch our dreams quickly began to turn into reality. Fast forward to today and we’ve designed a full quiver of shapes and styles that handle a wide variety of conditions and terrain. Not every day is a blower powder day but our designs allow us to ride our powsurfers 70+ days per season and that number would double if we didn’t have to work second full time “real jobs” to support our families and keep Grassroots Powdersurfing moving forward. Our shapes and style of build are a result of well over a decade of development, and thousands of days of testing and refining our shapes. Driven by an obsession with surfing/skateboarding, and a deep seated passion for riding powder, our journey has brought us full circle to our earliest days of skateboarding and snowboarding. When we discovered powdersurfing, we discovered the fountain of youth.